This is a complete mismatch chronologically – but there seems an undeniable synergy here (to me at least). For Jacob (the deceiver) is the one from whom the nation is named and the one privileged with extraordinary divine encounters. 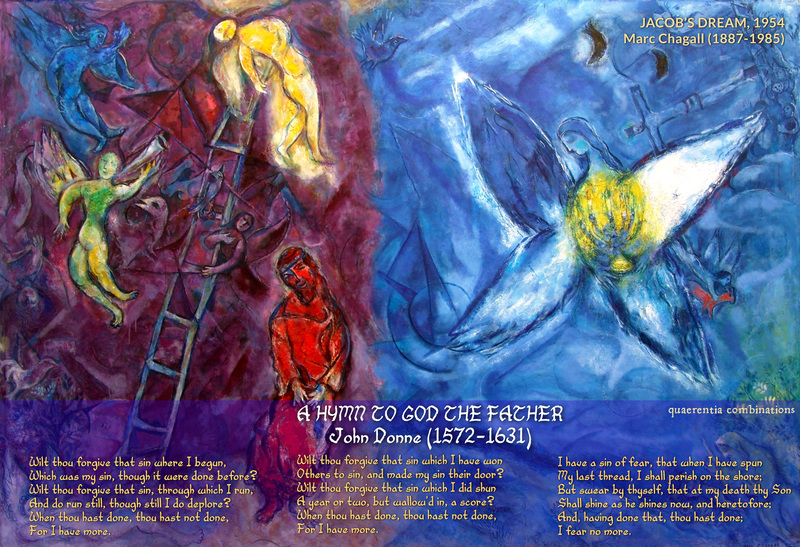 So this famous poem of the great John Donne is fitting. Yet it hardly seems like a Hymn in the sense that many think of hymns these days. But it is a heartfelt, brutally honest dealing with the Grace-giver. Donne knows he can’t hide from God. But what is remarkable is that in this poem, he refuses to conceal his own heart from us, his readers, as well. But it is far from a grovelly, conniving self-abasement. It is done always in the confidence of those precious final lines of the 3rd stanza. And that very same confident is echoed in Marc Chagall‘s simply glorious, exuberant retelling of Jacob’s dream of the heavenly ladder. For semi-concealed in the space all through the painting are dreamlike signs of this wonderful grace. Of course it wasn’t actually Jacob’s prayer. But it might as well have been… and I think that is why we have all those details on the right hand side of what is effectively a merged dyptic.